Isn't these "ice-cream cone cupcakes" look great for special occasions such as Birthday party, school function or even tea-time. I am sure not only the Kids fancy this, Adults like us will also love eating our favourite cake in a cone instead of on a plate too. 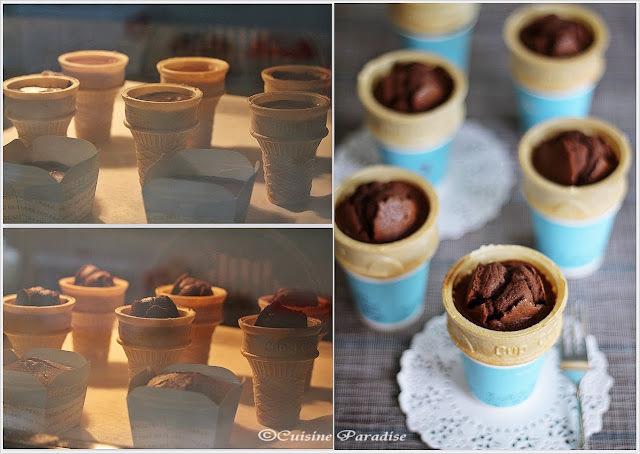 So why not give this a try and start making your favourite cupcakes in ice-cream cones instead of paper cases. Or just like us if you don't fancy frosting your cupcakes you can even eat it on it's own or top it with an extra scoop of your favourite ice-cream. I always love dessert such as Chocolate Brownie or Molten Chocolate Cake that serves with a generous scoop of premium Vanilla ice-cream. And when compared to other flavour, vanilla ice-cream is said to be the most popular flavour like by most consumers which is why you can always see vanilla ice-cream appears in most dessert corner or menu in major cafes/restaurants. Since I am making some ice-cream cone cupcakes for my neighbours as one of our tea snacks we decided to play a small game while waiting for the cupcakes to cool off. To start off we gathered 3 different brands of vanilla ice-cream to do a blind taste test and see which is the most popular choice among us. In this game, each family contribute one of their favourite brand of vanilla ice-cream and I would scoop it into 3 different cups and let all the participants take a blind taste test on each of them. For this test we had 9 participants from 3 different families with age group ranging from the youngest; 5 years old to the oldest 60 plus. Each participants will get to sample the prepared Vanilla Ice-cream from Haagen Dazs, New Zealand Natural and Ben And Jerry's without any knowledge of which brand they are tasting. So can you make a guess which is the most popular choice out of the 3 brands that most of them pick? 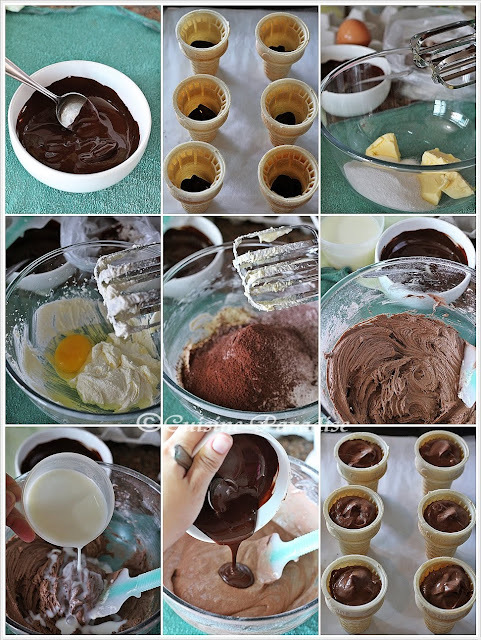 (result is shown at the end of this post) But before we scroll down to read the "taste test" result, let's take a look at the Chocolate Ice-cream Cone Cupcakes recipe shown below first. I have bookmarked this recipe for quite sometime but was not very keen to attempt due to the frosting part. So with some read-up and brainstorm with my facebook friends, I decided to give it a try without doing the frosting and replace it with a good scoop of Vanilla Ice-cream. 1. Melt 50g of dark chocolate in microwave on High for 40 seconds with an interval of 20 seconds each. 2. Arrange ice-cream cones on baking tray and place 2 feves of dark chocolate at the base of each cone. 3. Preheat oven to 160 degree. Beat butter and sugar in a bowl till light and creamy, add in egg and beat till well mixed. 4. Next sift over flour mixture(plain flour, baking powder and cocoa powder) and continue to beat until mixture became a gluey batter. 5. Fold in milk and stir with either a spatula or hand-held whisk till combine before stirring in the melted chocolate. 6. Spoon batter into each cone and fill up 0.5cm away from the rim. Bake in preheat oven for 15 minutes; increase oven temperate to 170 degree and continue to bake for another 10 minute or when skewer insert and comes out clean . 7. Allow cupcakes to cool for 10 minutes, running a small knife round the "hump" on top of the cake and remove it before stuffing it with a scoop of Premium Vanilla Ice-cream. 8. You can either drizzle extra melted chocolate, sprinkler or use the cut-off cake to place on the ice-cream to act as toppings. These cupcakes taste great even without any frosting. The cake itself is soft, moist and infused with "Triple" chocolate content. With each bites you can taste 3 different texture in one mouthful such as the crispy ice-cream cone, moist chocolate cake and cold ice-cream all mingling in your mouth. For your information these cupcakes are best to be eaten within an hour or warm so that the ice-cream cones will reminds crispy instead of soft and soggy after a few hours. But if you intend to keep for longer time you might want to consider reheat it in a 200 degree oven for about 3 minutes to revive the "crispness" of the ice-cream cones. Tata!!!!! Have you make the correct guess? Or you are surprised with the result shown above? Yes! I myself was surprised when I saw the results; out of the 9 participants, 4 voted(2 Young Adults, 1 Teenage and a Kid) for New Zealand Natural immediately after they tried all the 3 different cups of ice-cream whereas the other 5 participants still took sometime to decide which product to cast their vote. As for products wise you can still see tiny bits of vanilla pods in both New Zealand Natural and Ben And Jerry's. But in term of taste New Zealand Natural has the smoothest texture and mild creamy taste which does not overpower the vanilla fragrance. 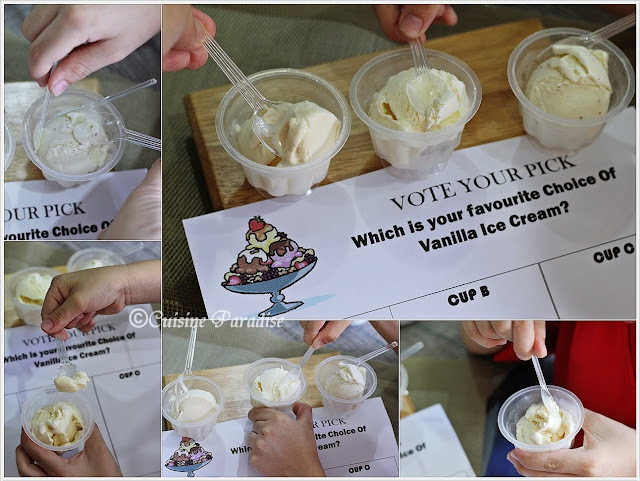 So if you like vanilla ice-cream perhaps you can also gather a few brands and do a blind taste test like us, have fun and enjoy the process as well as the eating those cold and delicious ice-cream especially during hot and humid days. Today I am very excited to have WaiFong from "Fong's Kitchen Journal" to share with us her National Day Special Cookies as her guest post. 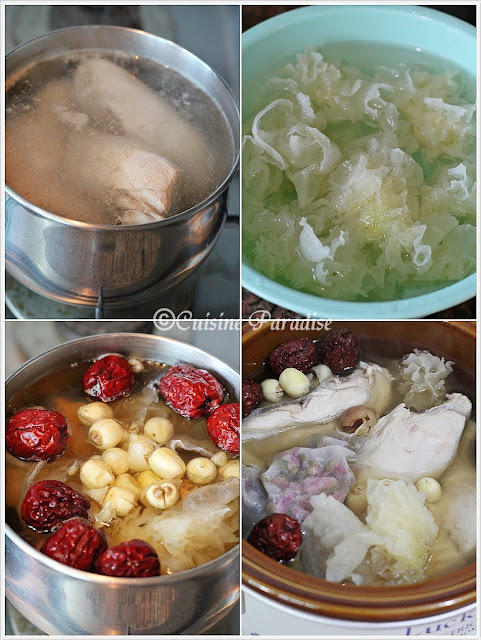 I get to know Wai Fong about a year ago through a giveaway event from my blog and since then I always pop-by her blog, drooling over her delicious "Fong's 三菜一汤 - 3-plus-1" that she whipped up for her family. On top of that, she is also one of our regular supporters for the monthly "S$20 Budget Meal" event. So let's put our hands together and welcome WaiFong to share with us her icing cookie recipe as well as thoughts on coming National Day. Enjoy! This is a very special post for me. First, as you can see, I have made some National Day Cookies here as a pre-National Day celebration. Tomorrow, I will be going down to Marina Bay to watch the NDP preview. And I am equally thrilled to be sharing this post with one of my favorite food bloggers, Ellena, at Cuisine Paradise. 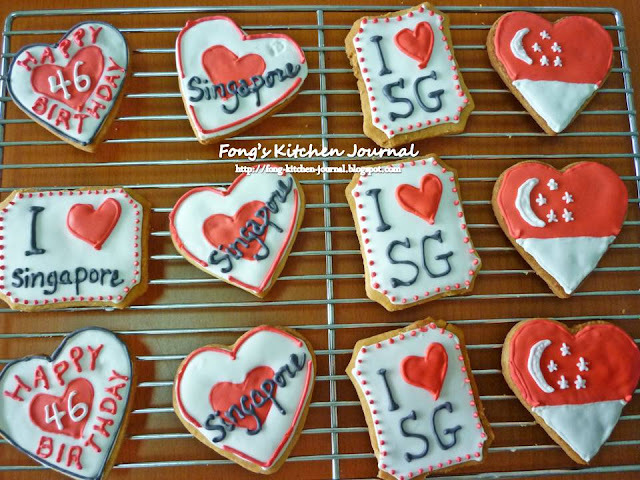 With about a week more to our National Day, I decided to make these cookies for my little girl and her pre-school classmates. I zoom in on two colours - red and white, the colours of our National Flag. 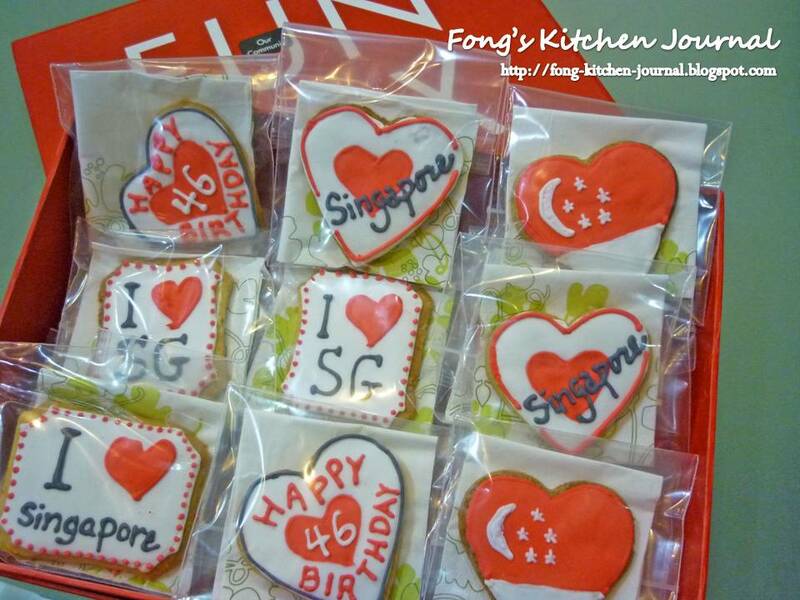 And, what's better way to pack these cookies than having them in this NDP Fun Box! For those who have attended last year's NDP ("National Day Parade") celebration, you might remember having this Fun Box inside the goodies bag. I thought this is also a great time for me, as a Singaporean and a young parent, to engage our little ones in some National Education. I design a simple quiz of 20 questions on Singapore, from "what is our National Anthem", " What does the crescent moon on our flag represents" to "Name 5 MRT stations on the East West Line". 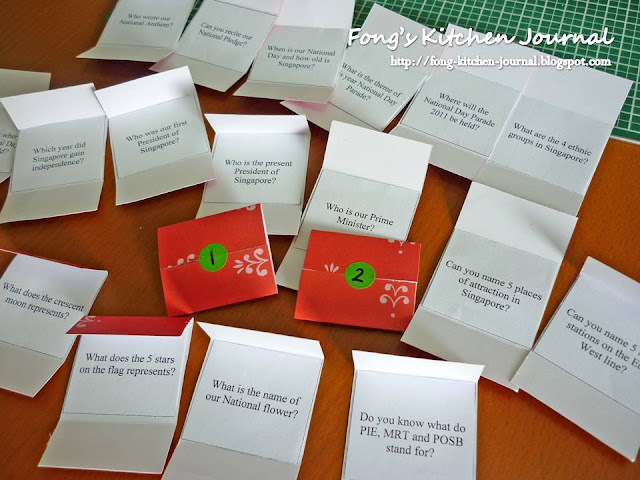 These questions are printed and glued on small little tags and taped behind each cookie pack. 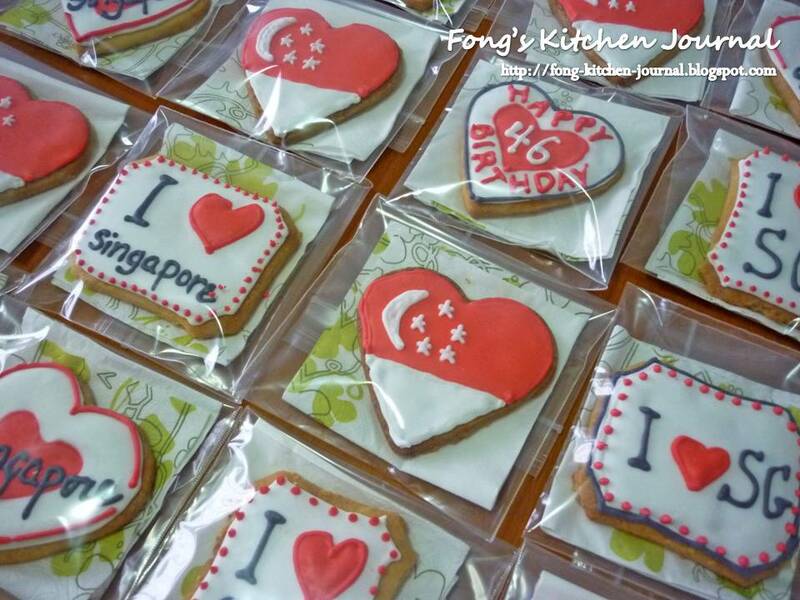 I hope while the children are enjoying the cookies, they will also get to learn something about Singapore. I used the same cookie recipe as my earlier Valentine's Day cookies. This cookie recipe yields very crispy cookies, but is extremely sticky to work with. If you prefer more manageable cookies, you may want to add a little more flour to it or cut down the butter to 200g. 1) Cream butter and sugar till light and fluffy (pale white). 2) Add egg yolk and vanilla essence, beat for another minute or two. 4) Divide dough to 2 portions, cover with clingwrap and rest dough in fridge for an hour. 5) Roll each dough between baking paper and clingwrap to about 2 to 3mm thick. 6) Rest the dough sheet back in fridge for 30 minutes (or 10 minutes in the freezer). 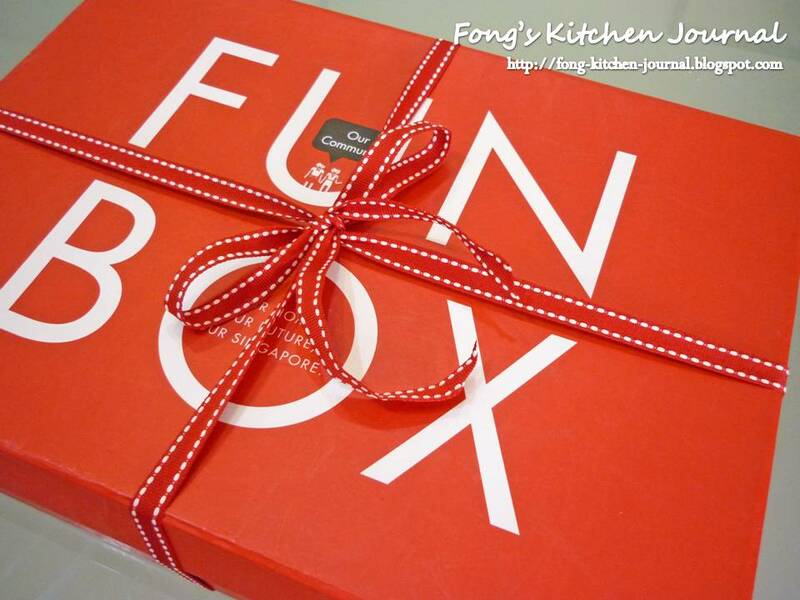 7) Stamp the cookies using cookie cutter and transfer them to a baking tray lined with baking paper. 8) Bake in preheated oven at 175C for 15 to 20 minutes. Let the cookies cool completely on rack before decorating. 1) Whisk meringue powder and water till foamy. 2) Add icing sugar gradually and continue to whisk till stiff and fluffy. 3) Add lemon juice and whisk for another 2 minutes. Add a little water (1/4 tsp each time) if the icing is too stiff and dry. 4) Divide into portions and mix in desired coloured gel. 5) For each icing colour, save a portion for piping the outlines (i.e. stiff icing); and then add more water (1/4 tsp each time) to get thinner icing consistency for flooding the cookies. 1) Working with red and black colours are the most tricky, as the red and black coloured gels will turn "pink" and "grey" when mixed together with the white icing. You could try preparing the icing a day ahead, as icing color will darken slightly with time (whisk it slightly before using). If you're preparing your icing ahead, do not make it too thin as it tends to be a little diluted the next day. Alternatively, some websites suggested adding a little cocoa powder to darken the shades. I have not tried this method. 2) Transfer the royal icing to piping bag(s) and use immediately. Else, cover the royal icing with cling wrap to prevent it from drying out. 3) I used a piping tip #2 for piping the lines. For flooding, I just cut a small tip off the disposable piping bag. 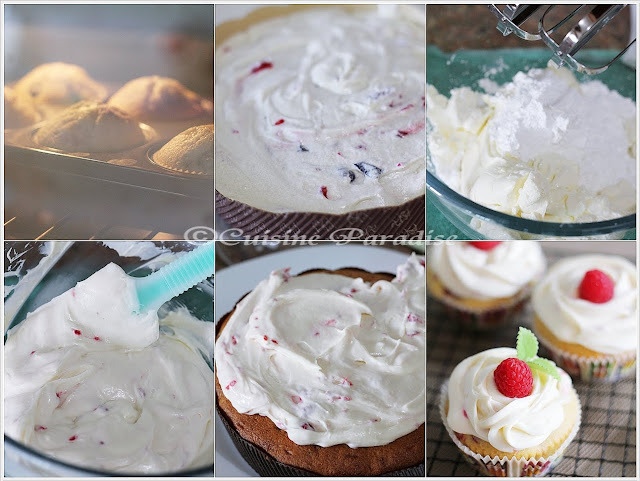 4) Click here for a detailed explanation on getting the right icing consistency. 5) Let the icing fully set and dry before transferring them to cookie bag. I left them in a air-con room for about 5 hours to set. Some websites recommend leaving them overnight, but I am concern that the cookies might turn soft. To know more about WaiFong and her blog, you can cross over to this link HERE to find out more about her cooking and baking recipes. Till then have a great weekend and stay tune for PART 2 of our National Day Special post which is done by me. I tried making this soup a few weeks back when I saw a photo tag of these ingredients in one of my friends, Alice facebook. Immediately it caught my attention because of one of the ingredients; "rose petals" which makes me very curious about the taste of this soup. 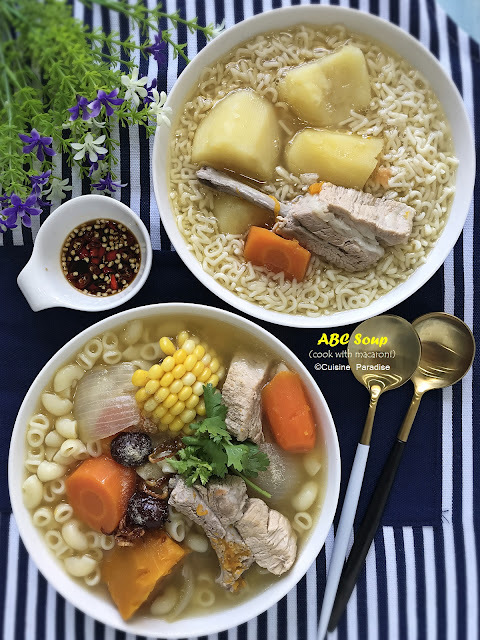 So without hesitate, I gathered all the necessary ingredients and try it out on the following day and it was very well-received by my family members including my small boy. As you can see from the ingredients, lily bulbs are used to calm the nerves and easy sleeping difficulty where else lotus seeds strengthen the Heart, Liver, Spleen and Kidneys and also energize the Qi and promote blood cell formation. 2. Next put the dried rose petals in stock bag; soak dried tangerine peel in water till soften then scrap out the white pith to avoid bitterness taste when cooked. 3. Bring 1.8 liter of water to boil in a soup pot before adding in all the ingredients. 4. When the mixture comes to boil again, lower the heat and simmer on very low heat for at least an hour or more. Or else transfer the mixture to a slow-cooker and cook on AUTO for at least 3 hours. 5. Season with/without salt to taste, serve it warm. The adding of Rose Petals act as a health supplement as well as provides a nice fragrance. And if consumed regularly it will also help in blood circulation and ease digestion too. Furthermore some research provides that it also reduces fats, whitening the skin and helps to relive discomforts that arise from menstruation. But most important it can actually helps you to maintain a youthful image. So this soup is a "must keep" recipe for all ladies who wish to maintain a youthful and fairer skin. The Cotton Family, winner of last year FairPrice Family CookOff Season 1 has fulfill their dream of owning a restaurant whereby they setup a French-style family restaurant known as "Cotton Bleu". Their restaurant is located along Upper Thomson Road with varieties of choices from Appetizer, Main Course to Dessert. Below are some of their dishes that we have tried during the Press Conference of this year, FairPrice Family CookOff Season 2. Marinated Duck wrapped in French Crêpe is one of the finale signature dishes cook up by the Cotton Family, during last year FairPrice Family Cook Off Season 1. The slices of flavorsome duck are wrapped in thin layer of freshly made French Crepe, give it a juicy and smooth combination which is quite different from those popular Asian Peking duck wrapped in pancake wrapper. Fresh Mozzarella Salad with Tomato, Prosciutto and Oriental Pears in balsamic vinaigrette with Mint serves as a great option for weight watcher as well as customers on vegetarian option. This is indeed a refreshing dish to start off before the main course. Half Dozen baked Escargots with Fresh herbs, Tomato and Garlic Butter suits those who love the combination of herbs, garlic and butter. The texture of the escargots are nicely done and infused with the aroma from the seasonings. And if you prefer you can even dip the bread roll into the butter herbs sauce which gives it with a great finishing taste . Roasted Spring Chicken in Beer and Juniper Berries, on a bed of Tagliatelle is my choice for the day. I love the roasted chicken which is wrapped with a layer of bacon which adds an extra flavour to the moist and tender roast which sits on a bed of tagliatelle. Grilled Codfish with French Beans in Provencal Sauce taste great with its special tangy Provencal sauce that help to ease out the greasy feel of Cod. But perhaps the french beans can be slightly under cooked to retain it's crunch bites which will be better in taste. Rosemary Lamb Racks with Pommes au Gratin and Red Kidney Beans might sounds tough if the rack is not properly cooked. But to our surprise the lamb was juicy and tender pairing with an unusual addition of kidney beans that release a sweet flavour when eaten with the lamb. Overall this dish received quite a number of thumbs up for that day too. Cotton Bleu FairPrice CookOff Winning Dessert: Floating Icebergs suits those with sweet tooth especially kids. I love the thick and creamy homemade custard base which top with generous scoop of poached egg white and drizzle of caramel sauce which give it 3 different layers of taste and texture. Indeed this is a very special homemade dessert which is pretty easy to make and it will definitely received well comments from most of guest. If you are interested to put your hand in trying out this dessert you can take a look at their recipe at FairPrice CookOff Official website Here. Accordingly to Herve and Susan(owners of the restaurant), during some of the days or special occasions they do prepared limited set of "Special" menu to surprise their guest. So if you want to find out more about their menu or make any reservation, you can either ring up the restaurant directly or drop-by their official facebook page to check their updates on the daily menu too. As you can see from most of my "bakes" I seldom do cake with frosting because my skill level of frosting is totally unbearable. I can't seems to frost a whole cake evenly with smooth finishing or at least something presentable. But after seeing Celes's mouthwatering "Blueberry Cake with Cheesecake Frosting" photo on twitter and facebook I decided to give her recipe a try. So with a twist to her recipe, I have made a Mixed Berry Cake together with some Cupcakes frosted with fresh Raspberry Cream Cheese. 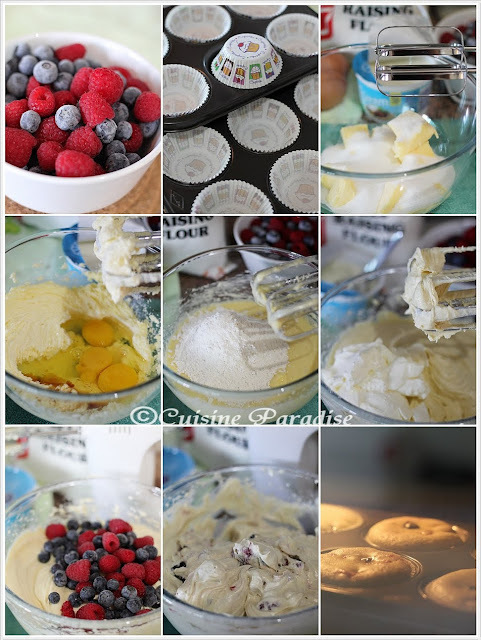 Mixed Berry Cupcakes made with half portion of the batter resting on the cooling rack. 1. Preheat the oven to 170 degree. 2. Cream butter and sugar for 1 minute, add in flour, baking powder and vanilla and continue to beat for another 2 minutes on low speed until thick and creamy. 3. Next beat in 4 heap tablespoons of sour cream then stir in the mixed-berry using a spatula or wooden spoon till well mixed. 4. Scoop the mixture evenly into a 7" disposal round case and the remaining batter into 6 holes muffins tray line with paper cups liner. * Bake the 6 holes muffins tray batch at 20 minutes or till skewer insert and comes out clean. 6. Cool for cake/cupcake on the cooling rack till completely cold when touch before proceeding to the frosting. The Original recipe calls only cream cheese, icing sugar and sour cream but in order to make the frosting more colourful and presentable. I added about 10 raspberries into the beaten cream to enhance the taste, texture as well as visual effect to the frosting. 1. Beat the soft cream cheese with the icing sugar and the remaining soured cream in a bowl until smooth and creamy. 2. Add in chopped raspberries and give it a quick stir or two till mixture is well combined. 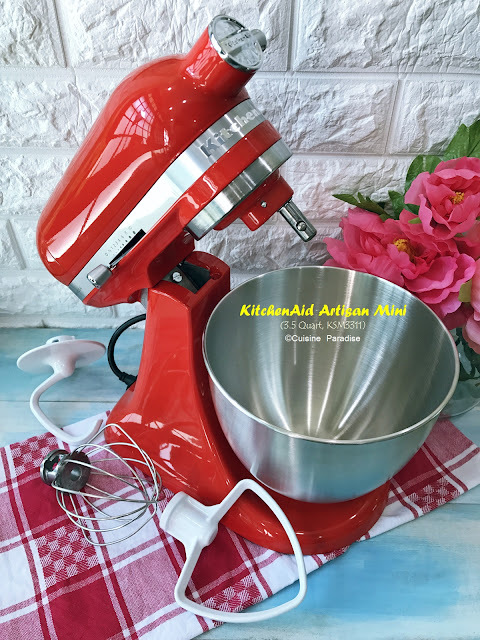 * Spoon a few tablespoons of prepared cream mixture into a pipping bag with a "Wilton 2D" pipping nozzle attached and pipe rose design starting from the middle of the cupcake in clockwise direction. Overall this is a very soft, light and moist cake made with fresh berries that makes you feel irresistible with its fruity flavour cream cheese topping. And according to Celes, these frosted cake can keep well in the fridge for a couple of days. But before serving, it will be best to bring it to room temperature so that the texture will be soft and moist instead of harden and dry due to storing in the fridge. Lastly I would like to thanks Celes for sharing this wonderful recipe as well as her patience in walking through the steps and sharing of handy tips in the baking process. Sorry for the lack of post(s) these few weeks because I was pretty busy with a few projects on hand. I would try to get all the draft post(s) published as soon as possible but to compensate, I have invited a few well-known bloggers to guest post(s) some of their home-style dishes and bakes. Today's let put our hands together and welcome Nami from "Just One Cookbook". I know Nami through her comments on my blog a few months back. From her blog link I also get to know her better as well as exploring her wonderful recipes collection on her home-style Japanese Cuisines. She is also the one who help me to look up recipes on Japanese website regarding the Japanese Steamed Cake which I wish to learn more about it. 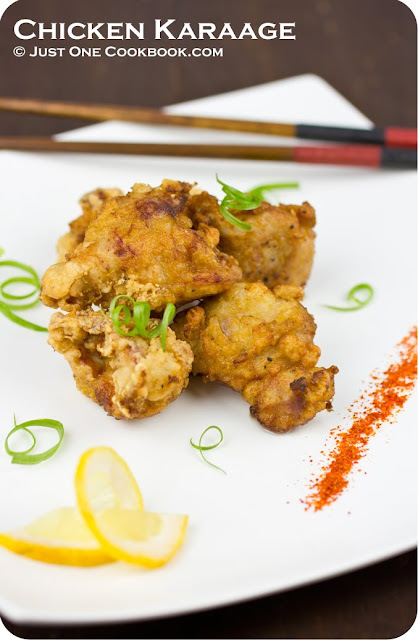 Today I am so happy to invite Nami to Cuisine Paradise to share her classic “Chicken Karaage” recipe with us and I sure you would like it as much as we do. Enjoy! Hello readers of Cuisine Paradise! Usually, I’m just the same as you, a fan enjoying Ellena’s delicious creations. 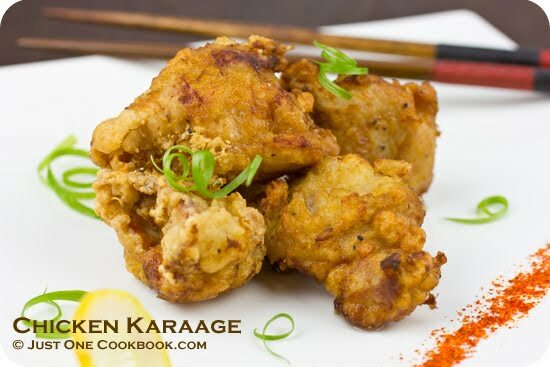 She was generous to invite me to contribute a recipe on her site so today I will share one of my family’s favorite Japanese dish, Chicken Karaage (鶏の唐揚げ) recipe. I am a dedicated visitor to Ellena’s site and her mouth watering photos always make me hungry. With her extensive library of recipes from around the world, I learned so much from Ellena and especially Chinese and Southeast Asian cooking techniques. Personally I’ve used multiple recipes from her site to feed my family lunch and dinner and her website has been a great inspirational resource. 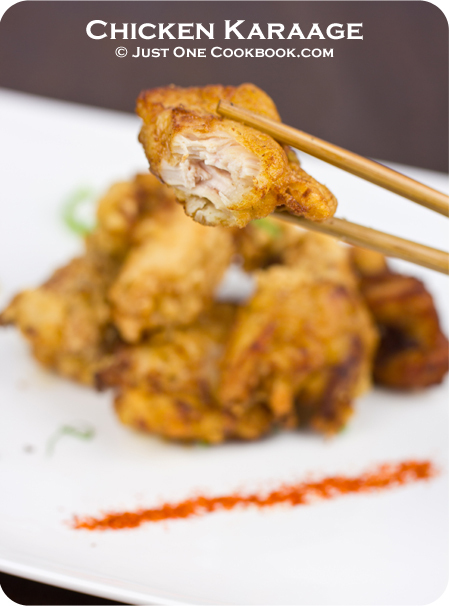 Chicken Karaage is a classic Japanese fried chicken dish. It’s a very common Japanese home cooking recipe and many Japanese restaurants including Izakaya (Japanese tapas) offer it in many countries all over the world. You might also find them as a main dish in lunch teishoku (meal set) at restaurants or bento box (lunch box) you buy from Japanese supermarkets. Usually the chicken is marinated in a mix of soy sauce, garlic, ginger, and lightly coated with potato/corn starch mix, then finally deep fried. However, each family has different way of preparing it, and here is mine that my family loves. I hope you enjoy my Chicken Karaage recipe and thank you so much Ellena for having me! 1. Put chicken in a Ziploc bag and combine all the ingredients for Seasonings in a bowl and mix all together. 2. Pour the Seasonings into the Ziploc bag and rub the chicken well with hands. Keep it in the fridge for at least 1 hour, preferably 3-4 hours. 3. In a wok, add oil to about half way full and heat it on medium high heat. When you put a chopstick in the oil and bubbles start to appear around the tip, the oil temperature is now around 180C (356F) and ready for deep frying. 4. When oil is ready, take out the Ziploc bag from the fridge and transfer the chicken into a bowl and discard the marinade (liquid). Then add corn starch and mix quickly. You don’t need to mix it evenly (as you see in the picture below). The uneven coating gives each piece its unique texture. 5. 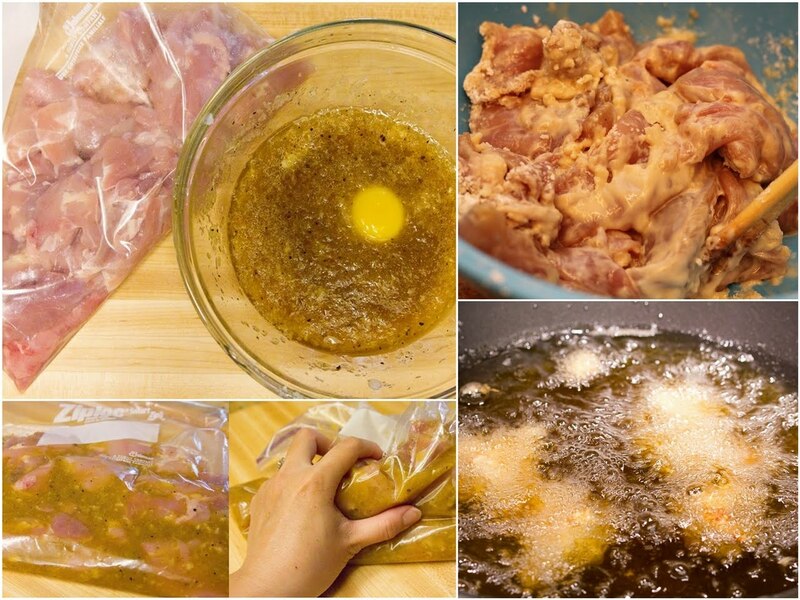 Place each piece of chicken separately into the oil. Do not overcrowd the wok, fry maximum 5 pieces at a time. If you put a lot of chicken in the oil, the temperature will drop quickly and chicken end up absorbing too much oil. Make sure the oil temperature stays around 180C (356F) at all time. Deep fry for 90 seconds. Deep fry again for 45 seconds, or until golden brown. Transfer the chicken onto a wire rack to drain the oil. Before you start the next batch, skim/remove leftover crumbs from the oil in order to keep it clean. 6. Serve the chicken with lemon wedges. Squeeze the lemon right before you eat. You can dip in Ichimi Togarashi if you enjoy spicy chicken. For more Japanese home-sytle recipes, you can refer to Nami website at Just One Cookbook for more recipe ideas. Which is your favourite Premium Ice-Cream And Flavour? As a mum with a young kid at home, our freezer compartment is always fill with either one/two tubs of our family after meal dessert - "ice-cream". And our usual all-time favourite will be either Chocolate/Cookies and Cream for my boy whereas Vanilla for me in order to make my enhance my root beer float or serve as a topper for my homemade brownies or crepes. Sometime I always think we are so fortunate to live in Singapore whereby we can easily access to a wide range of Ice-Creams either manufactured in local or air-flown from overseas. And as you can see from the above photo, there are so many different brands of ice-cream from budget to premium displaying in the fridge area waiting for you to pick it up. 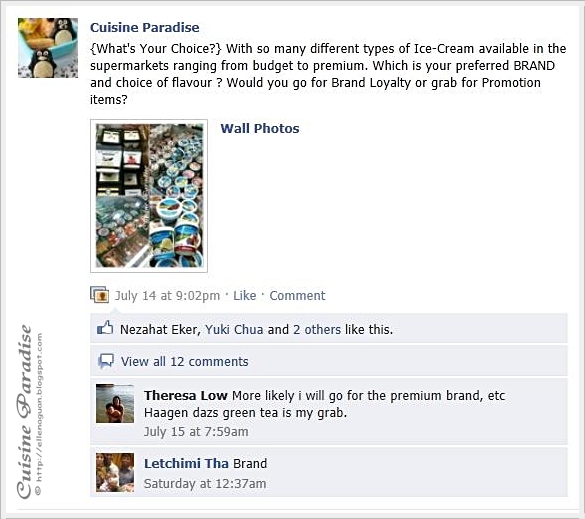 Often some of the loyalty brands which attracts most of the consumers will be like Haggen Dazs or Ben and Jerry's whereby they always come in a bundle promotion of S$20++ for two tubs in assorted flavours that you can choose from. On top of all those familiar ice-cream brands, this month from July onwards you can find another 6 different flavours from New Zealand Natural(NZN) sitting side by side with those premium brands EXCLUSIVELY only in all Cold Storage Supermarket outlets island wide. And I am sure this is a great news for NZN consumers like us where we can now enjoy our favourite premium ice-creams at more accessible areas rather running down to their outlets in town or east side areas. ~ What's your criteria for choosing a tub of Premium Ice-cream? Is it because of its unique flavour, process of making(ie. fat free), ingredients or(ie. using fresh fruits) OR? Hope to see your views regarding your favourite brand and flavour soon. [June - $20 Budge Meal] Round-Up!